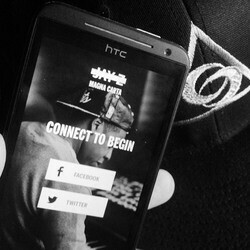 Last month, Samsung launched Magna Carta Holy Grail – the newest album by Jay Z – in the form of an Android app available exclusively to select Galaxy owners. Basically, anyone who owned a Samsung Galaxy S4, Galaxy S III, or Galaxy Note II, could download and listen to the album prior to its release on July 7. On top of that, the first one million users who downloaded the app before July 4 were entitled to getting the album for free. However, Jay Z's album might not be that exclusive anymore. This guy named Eas Wood somehow managed to install the Magna Carta app onto his HTC smartphone. Wood, who is one of the people behind the mobile music app NervEight, then posted a photo and video of his handset running the app as proof. But at this time it doesn't seem like the Magna Carta album is freely circulating the web in APK form, and how Wood managed to get the album isn't clear. Nevertheless, Samsung might not be too happy about this making the rounds, especially after it paid $5 million to launch the album in advance exclusively to Galaxy users. Uhm, why is this news? Uhm, Why did you read it? Yea, why IS this news? I also installed the Jay Z Magna Carta Holy Grail app on my ATT Galaxy S II Skyrocket... it's not that hard to get around that simple "device incompatibility" message on the Play Store. Just because they can install the app doesn't mean that the album will download to their devices and if it does, it's not a big deal by any means. It looks similar to the EVO 4G LTE.